The story on the GR Groovin High Mouthpiece starts with Maynard Ferguson. Maynards first mouthpiece when he was about 16 years old was a Rudy Muck 16 C given to him by his trumpet teacher. It had a wide cushion rim with a medium V cup. Maynard had the rim ground down making it shallower and making the cup diameter smaller. Not very scientific but it worked for him. Maynard played this piece throughout his time with Stan Kenton. He then went to Dominick Callichio and had a hand made one of a kind mouthpiece made that he played from the late 50's till the mid 60's. Maynard gave this piece to Roger Ingram sometime in the 80's. Roger said he liked it and Lynn Nicholson also played it and called it "The Holy Grail." I called Roger and asked him if he would take it to a mouthpiece maker when he was in Pennsylvania and have it cloned, this would have been in 1985. Roger play tested both the original and the cloned piece for a week and said they were almost identical in blow and sound. The Groovin High Mouthpiece was born. Some years later I found Gary Radke and sent one to him and he did his "reverse engineering magic". That improved the mouthpiece greatly. 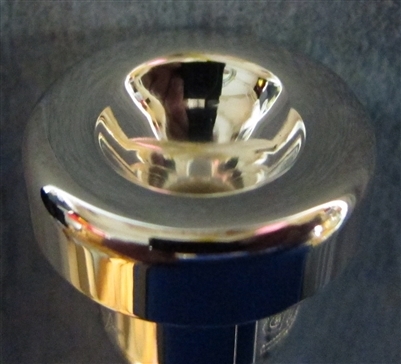 The Groovin High Mouthpiece has been quite popular for Lead and High Note players.